Great quality boots, soles seem indestructible. They are fairly comfortable right out of the box, broke-in even better. Favorite pair of boots I got or had. Best boots I've ever had shoeline makes it easy to order and are 100% accurate with the order. Great quality boot!!! I highly recommend. Wonderful boot!!! Runs small & narrow. Very well made. I highly recommend! 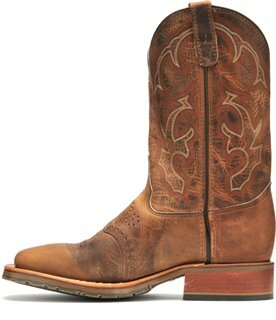 My husband & kids love this boot. It is very well made. Runs narrow & small. I highly recommend. Best pair of boots a man can purchase. I received my Double H 3560 boots right on time.I put the right one on a and it was as if Double H had used my foot for the form. I then put the left boot on and it was a little tight across the toes - specifically my pinky toe. I applied a little spot of leather stretch spray to the area I wanted to loosen up and decided to wear them in. After 3 days I gave up and ordered a "Foot Fitter" western boot stretcher. After installing the boot stretcher over night it now fits beautifully!The boot stretcher was $45, but should be considered mandatory equipment for anyone with a collection of western boots. Ever try and put on a pair of boots after not wearing for a year?To sum up; The Double H 3560 looks great and fits great.Note: I'm a 50 year old guy that has endured a few bouts of gout so the knuckles of my left foot most assuredly had something to do with the initial fitment issues.5 ????? These are my husbands favorite boots and his 2nd pair. These look nice for casual dress attire also. Double H boots fit like a boot should fit.I would put their boots up against any ones for comfort. I have a narrow toe D-H boot that fits a little loose so I ordered a size smaller in the 3560 well they were to snug. Returned them, which was very easy, and got my reg. size which fit great. The new boots were received in no time, and fit great. My first pair of square toe and I really like them. I have worn several other brands of boots in the past. Some I have liked a lot others not so much. However Double H has by far been the best I've worn. Very comfortable and easy to wear all day long. Love these boots! They're a lot more durable than other brands I've gone through. The best pair of boots I have ever owned. Very well made. Broken-in feel straight from the box. Very attractive. Very comfortable (I use a pair of Sole Ultra footbeds). And the fact that they are made in the U.S. makes them even more sterling. Shoeline's service and delivery time was also exceptional. Since I work in heavy industrial construction/services and am on my feet 10-12+ hrs a day, 5-7 days a week, I cycle two pair of these every other day and plan on purchasing at least one more pair to add to the rotation/serve as backup. I've ordered these same boots twice in the past 6 months...my boyfriend LOVES them...one pair he wears to work for comfort...the other he keeps clean to wear for "good"...I'm sure I'll buy this same exact boot again. Great looking sturdy boot for the wide and high arched person.Great tread for ice.Got mine with promo code and could not be happier. Best boot I have ever owned. And I have owned a few. Extremely well made and comfortable. The fact that these are made in the USA is a plus as well. This was a great pair of boots and fit well and already feel great within the first week of wearing. I’’m not sure how to reason the logic of the sizing question so: I wear a 12 in every shoe available EXCEPT these boots. I am wearing a size 11 in this boot with a perfect fit. Brought this booth for my son He LOVED IT You can"t beat the pricethe no tax and FREE SHIPPING both ways He loved the color the fit and the over all look of the booth. Now I know the next time he wants boots I know where to go. My son really liked the boots ordered 12ee and they were wide. Have returned them for a d width. will up date as to how they fit and how the return went. A comfortable working boot that won’’t look out of place while out and about.